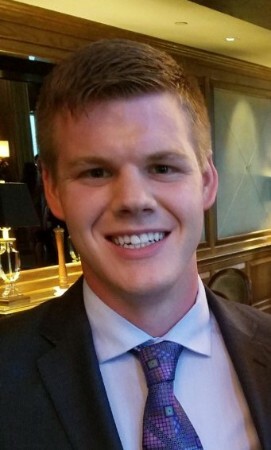 John P. Weldon is an MBA/MSIS candidate at Baylor University, with experience in international logistics, international shipping, maritime operations, distribution, trucking, compensation, and management of people in the United States, Europe, Middle East, and Asia Pacific. John was in the U.S. Navy Reserve and has worked for several commercial companies on vehicle carriers and a container carrier, as well as for Military Sealift Command on an auxiliary cargo and ammunitions ship. This past summer, he completed an internship with Andrews Distributing in Dallas. He also enjoys volunteering. In March, he volunteered through Baylor with Bluprint Athens in Greece, where he led a team that developed and delivered an entrepreneurship program. Since November 2017, he has been a Business Plan Advisor for the Prison Entrepreneurship Program. In what ways did your experience in the U.S. Navy Reserve help prepare you for, and perhaps influence, your professional track in shipping and distribution? While I was in the U.S. Navy Reserve, I studied marine transportation at the U.S. Merchant Marine Academy, where I learned about marine transportation, marine engineering, trucking, rail, air freight, pipelines, electronic interchange, intermodalism, multimodalism, and transmodalism. During my year at sea, I had the opportunity to apply much of what I learned, working for several companies in North America, Europe, the Middle East, and Asia Pacific. You attended our summer receptions in both Houston (with Caroline Joiner) and Dallas (with Carly Fiorina). What were some highlights of these events for you? Highlights included the ability to talk one-on-one with both speakers, to network with fellow members of the Adam Smith Society, and to learn from the experiences of the speakers and fellow members. Carly Fiorina, with her experience in business and politics, spoke about where she sees society heading. Caroline Joiner also spoke about where society is heading, as far as technical development and knowledge, and how we can ensure that our school systems change with the technology, in order to produce the most qualified and productive members of the workforce. How has your volunteer experience—with Bluprint Athens and the Prison Entrepreneurship Program—informed your worldview? What motivated you to get involved? I became involved in Bluprint Athens through Baylor University; and in the Prison Entrepreneurship Program after seeing Baylor’s promotion of the program on its website. I love volunteering. With Bluprint Athens, I wanted to learn more about and help with the refugee crisis and situation in Greece and other countries. It expanded my worldview because I learned from individuals firsthand about the situations in their home countries that they had experienced, which included corruption, terrorism, and religious persecution. I also learned about how the current economic situation in Greece is causing difficulties for aspiring entrepreneurs and current entrepreneurs whose credible businesses are being hurt because they are doing what they believe is the ethical course of action—while other businesses are not abiding by laws and regulations. Bluprint Athens is helping the economic situation in Greece through the creation of businesses and by advising businesses that are having operational issues. With the Prison Entrepreneurship Program, I worked with former inmates who had created a better life for themselves and their families. I believe that everyone deserves another chance. The Prison Entrepreneurship Program has shown me how the giving of time and guidance can make all the difference in the lives of inmates. Many of them come from backgrounds that led them into the lives they have; we provide guidance to help them to lead better lives. A Baylor study has shown that every dollar donated to the Prison Entrepreneurship Program yields a 340% ROI due to avoided re-incarceration, increased child-support payments, and reduced reliance on government assistance. What are you looking forward to in the upcoming academic year with Smith Soc? I am looking forward to being able to meet more speakers from varying backgrounds to gain knowledge from their experiences, as well as to network with fellow Smith Soc members at these events and gain knowledge from them. I enjoy the discussions at the events on the speakers’ topics and on other issues in society, government, and its influence on economics. I am planning to apply for the Business and Government trek to Denver, and hope to have the opportunity to hear about the connections between business and government. I am interested in how other members view the privileges that some companies receive from these connections and how the relationships between various companies and government should be managed. This topic is fascinating because many companies also have the finances to fund crucial lobbying efforts that help their industries and businesses. These aspects and others shift the power between industries and the geographic areas that house these industries.